Or, to be more accurate, one more thing for those of us who are Knucklehead aficionados to worry about; but that wouldn't have fit in the title box. One of my long time customers who goes by the name "Tom" (and I suspect it may be his real name) has had the same Knuckle for as long as anyone around here can remember. Over the years, I have had my hands on and into most of the parts of his engine, but never all at once. You see, Tom is just one of many Knucklehead owners who like to do as much of their own work as possible. Back when many of us started riding Knuckles, this was often out of necessity as much as choice, paychecks being what they were. In any case, somewhere between the turn of the century and 2005, Tom had me order up a set of new reproduction Knucklehead tappet blocks for him. I really don't recall the specific occasion, whether it was a broken flange, or maybe it was Valentine's day and he wanted a special treat for the old gal. I ordered a set from Flathead Power. At that point in time, Flathead Power was in no way connected with S&S - it was still "in transition" between its founder, Anders, operation in Sweden, and the acquisition by S&S. That transition period, and the unscrupulous characters involved have been gently exposed elsewhere, so I won't comment further. Tom installed the FHP lifter blocks with a new set of lifters, and went on his way - which way consisted of putting lots of miles on his '42. Fast forward through several years of hard riding, and Tom found himself in the need of a complete rebuild following a catastrophic parting of the ways of many of the engine parts which formerly made up his '42. The word grenade could be aptly applied. As part of the resurrection, Tom opted to use another Flathead Power product which he had acquired, that being a set of FHP Knuck heads (also pre S&S vintage). Here again I was called into the act to provide oversize intake valves along with porting work. Knowing that the master plan called for a high lift cam (by Knuckle standards) I was very careful to get the stem protrusion on all four valves in just the right place to provide for a combination of the correct valve spring installed height and retainer to seal clearance while keeping the guide as long as possible to promote longevity. That is why what happened next left us scratching our heads. Because of the special order 3-5/8" bore pistons which were chosen to match the 4-9/32" stroke flywheels and provide his targeted compression ratio, Tom mocked up the new engine parts with clay in the valve reliefs to be sure clearances were sufficient. Immediately a discrepancy became apparent. The rear intake valve to piston clearance was approximately .100" more than the front intake. Puzzling to be sure, but a problem...? If this had been a well used set of heads with untold numbers of past valve jobs, it would not have been too surprising, but that was not the case here. Suspecting a possible, albeit unlikely problem with the new Leineweber cam, Tom substituted his older, milder Leineweber cam. Same difference in clearance front to rear. Yet another check with a stock Knuckle cam gave the same results. Mr. Leineweber's name was thereby cleared of any crime in this case. At this point I was starting to worry that I had gotten the stem protrusion off by .100" on one valve - not such a stretch given the human capacity for mistakes and the fact that my stem protrusion measuring device features a dial that measures .100" per revolution. I had Tom bring the heads back in so I could double check my work. To my relief and consternation, the problem was not in the stem protrusion. My next thought was that perhaps there was a difference in the height of the machined surface that the valve guide bottoms out against from one head to the other. Some careful measurements which involved placing the head gasket surfaces on a table and dropping a steel rod through the guides proved this also was not the culprit. I was nearly out of ideas, but there was one logical check still to make. I set up the lower end for my '46 with a degree wheel to perform what is commonly known as "degreeing a cam." Finally! By checking the opening and closing events with both a stock set of lifter blocks as well as with Tom's FHP blocks, it was obvious where the problem lay. The rear intake was opening 27 degrees later on the FHP block compared to both the stock block and to published specs for the cam (measured at .020" lift). And of course, checking the tappet lift at TDC, showed the difference between the valve to piston clearances which Tom had found with clay. The timing for both the exhausts and the front intake all matched those taken from stock lifter blocks. Now the only puzzling thing left to this story is that there was no large noticeable loss of performance when Tom installed these lifter blocks! I certainly would not have expected that. 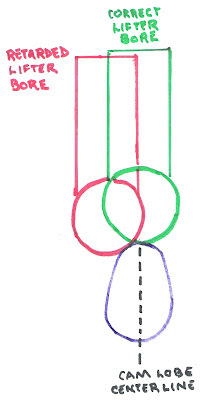 The drawing below should help you visualize what the problem is, despite the sore lack of artistry. It is not to scale whatsoever, but shows the relationship between the tappet bore and the cam lobe centerline in a way that (I think) makes it understandable. However, a little closer look at the figures gives a clue. Looking at the .053" lift timing, the difference between the FHP and the stock lifter block shrinks to 20 degrees on the opening side and 16 on the closing. That puts the timing on this rear intake, when used with this performance cam, pretty close to that of a stock Knuckle cam. In essence, for several years, Tom's '42 was running with a "hot" cam on the front cylinder, a hot cam for the rear exhaust, and a stock cam for the rear intake. My guess is that had he been running a stock cam, the performance loss would have been much more noticeable. An important note. When this problem became evident, I contacted the gentleman at S&S who heads up the Flathead Power division and was pleased to find out that they had found the same issue and corrected it before they went into production, so you can rest assured that if you purchased FHP lifter blocks after S&S took over, they are machined correctly. I procured a new S&S block for Tom and he can attest that the valve to piston clearances now match front to rear. One other note. I have no reason to think that ALL the pre S&S FHP rear lifter blocks suffer from this defect. It could very well have been just one run of the blocks made during that "transition" period. But that brings us back to the title of this post, doesn't it? On February 14th we celebrated Valentine's Day. When we think of Valentine's day, we naturally think of love. The word love is used over 250 time in the New Testament alone. The vast majority of those instances it is translated from two very closely related Greek words (agape and agapao) which basically mean ....you guessed it; love. Digging a little deeper, we find affection, benevolence, and even charity. I had a pastor once who often said that "love is an action not a feeling." It would appear that technically he was wrong about that, but in application, I believe he was definitely on to something. If we start to look at some of the verses which have the word love in them, we soon begin to see a sort of cause and effect type relationship where the love causes an action. One obvious verse that comes to mind is John 3:16 For God so loved the world, that he gave his only begotten Son, that whosoever believeth in him should not perish, but have everlasting life. Cause and effect. The cause was that God loved the world; the effect was that he gave his Son; the effect was that we don't have to perish; the effect is that we can have everlasting life. That is love being carried out through an action! This verse very likely refers back to just before Jesus went to the cross when he said in John 13:34 A new commandment I give unto you, That ye love one another; as I have loved you, that ye also love one another. 1 John 3:16-18 Hereby perceive we the love of God, because he laid down his life for us: and we ought to lay down our lives for the brethren. But whoso hath this world's good, and seeth his brother have need, and shutteth up his bowels of compassion from him, how dwelleth the love of God in him? My little children, let us not love in word, neither in tongue; but in deed and in truth. Here we see a cause and effect relationship of love clearly illustrated. We can see that God loves us because he laid down his life for us, and our love for each other should show itself in the same way; as a willingness to lay down our life for one another. John goes on to say that if you see your brother in need and have the means to help him, but won't, then God's love is not dwelling in you. As it says here, don't just say you love your brother by your words, show it by your actions. Did you catch that? Love is of God, and in fact God is love! Loving one another is one of the "proofs" that we know God. And here again, John goes on to name a cause and effect. God showed us his love for us by sending his Son into the world so we can live through him. And John makes it plain that the love came first from God. He didn't send his Son because we loved him, but rather he sent his Son because he loved us. And the natural effect is that since he loved us so much, we should also love one another. Here again, John lays out the notion that Christians should love each other. In this passage he states that one who believes Jesus is the anointed one, is born of God; in other words born again. And if you love the one who you were born of, you will love others who are born of him. That's natural, because you have the same Father. They are your brothers and sisters. John goes on to point out that this equation works both forward and backward. In chapter four he told us that loving one another was proof that we love God. Here he says that loving God is proof that we love God's children. But here he adds a little something, and that is "keeping God's commandments." The way that we show love to God is by keeping his commandments. Now whether you want to include the ten commandments in here or limit it to the commands that Jesus gave when he was here in the flesh hardly matters. Either way we have all failed miserably at keeping them. Those are only two commands of Jesus, and both of them having to do with loving others. Have any of us kept those commands? Have you always loved your enemies? Always? Maybe I should make that "have you ever?" I don't know about you, but I have even failed at always loving my friends and family. That puts me in the same boat with everyone else. I am a sinner. That's right, God loved us, and he didn't just tell us that he loved us and then left us to perish in our sins. He put that love into action. John 3:16 For God so loved the world, that he gave his only begotten Son, that whosoever believeth in him should not perish, but have everlasting life. If you haven't already done so, wont' you take the first step in returning God's love? Won't you turn from your sins and to Jesus Christ, believing that he paid the penalty that we each deserve? 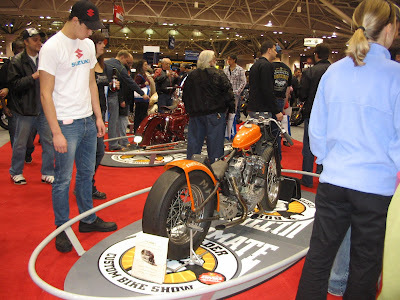 So, about a week ago my friend Neil approached me about a bike show. 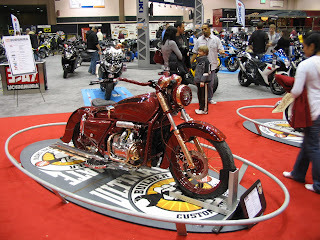 I seemed that a promoter friend of his was short some entries for the local edition of the International Motorcycle Shows and that they would be willing to waive all fees if I would enter the Knuckledragger. Since they draw in excess of 50,000 people for their three day event, it seemed like a good way to drum up a little interest in the National Vintage Motorcycle Drag Racing Association, so I agreed to do it. Friday morning the wife and I loaded up the bike and headed to the Minneapolis Convention Center, where the Knuckledragger took up residence until Sunday evening. The gentlemen running the show were kind enough to bend the rules a bit by allowing me to put fliers next to the bike to promote the NVMDRA. As bike shows go, this venue is more akin to an expo, with all of the motorcycle manufacturers being heavily represented, displaying all the latest models. 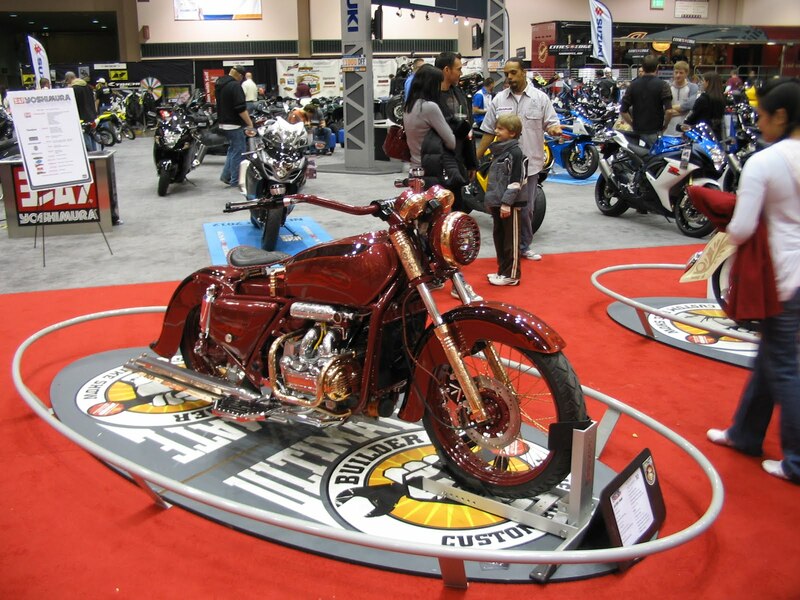 The "custom bike show" within the show is really quite limited, featuring fewer than two dozen bikes divided into four classes. The "Retro Mod" class which required the bike to be at least 25 years old seemed to fit the Knuckledragger best. I walked away with a second place plaque for my efforts. That would sound slightly impressive if it were not for the fact that there were only two entries in the class. The winner took home a check for $1000, and I got a plaque that says 2nd Place, but really means last place. Oh well, at least I didn't have to spend any time polishing my bike. 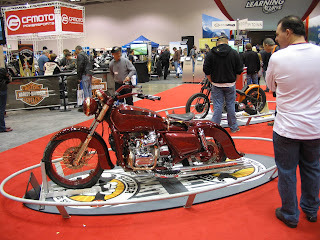 Above are a couple shots of the Gold Wing which placed first in Retro Mod. Now that means I have been beaten twice by a Gold Wing in the space of only 31 short years! The first time involved some "street racing" during the summer of 1981. 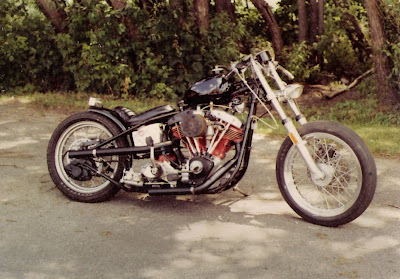 I had just stroked my Shovelhead to 88 cubic inches, leaving everything else in the motor stock, right down to the cam. The Shovel felt really strong, and so I was really taken aback to be trounced by a stripped down and slightly warmed over Gold Wing owned by the service manager at a local Honda dealer. Sifton 468+ cam, solid lifters, hi-performance valve springs, ported heads, SU carb, Barnett clutch, and a Goodyear "rain slick" ...I wasn't about to let that happen again. But now, by the grace of God, I am older, wiser and can take a loss in stride. In other words, the Knuckledragger won't be acquiring new paint, chrome or gold plating, and the show bike world will remain safe.